Tracey Casciano had always dreamed of writing a book but, “Out of the Darkroom, Into the Light” is one book she never thought she would write. There are times in some of our lives that we have to do things that seem impossible in order to be able to move on. This is one such thing. Tracey’s story begins in 2013 as she sits in her church where the pastor talks about forgiveness. As she struggles to keep her emotions intact, she couldn’t help but remember living with an alcoholic mother and abusive father. She felt if she forgave them she was letting them off the hook. Why should she spare them when they never spared her, or even cared about her? Born in 1971 Tracey was an only child. During her early years things seemed to be fine, yet there was always some lingering thought as to why she wasn’t good enough for her father–he wanted a son and took every opportunity to let her know that. She really never had anyone to talk to as her mom was drunk and passed out daily. Every chance she got she went to her friends’ houses, and she realized her home was not normal. It became more evident when Child Protective Services showed up at her house. Eventually her mother’s drinking became worse as she developed seizures and had frequent hospitalizations. It was during this time her father began his “nightly visits.” Scared but yet wanting her father’s love and attention, Tracey never mentioned the abuse. Now as an adult with a child of her own, the author reflects on how she hopes she provides her son with wonderful memories and a relationship with God. As she tells her story she provides numerous scriptures that will help others through their own difficult times. She admits she has her own mixed emotions, she still feels insecure and angry at herself for letting those things in her earlier life happen. Readers will find that Tracey’s story is about helping others realize that if you have a relationship with God he will see you through your darkest hours. The author is very open and honest about her family, what happened to her and the impact it had on her while growing up and later as in adulthood. 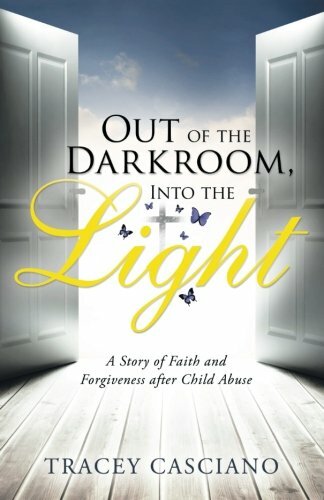 “Out of the Darkroom, Into the Light” by Tracey Casciano is very well written, sometimes hard to read, yet at the same time very encouraging regarding change that can happen. Very open, honest writing. Her story shows a slow relationship with God and how through him one can see the light at the end of the tunnel.